The Yacht Club de Monaco magnetises the attention: this Norman Foster-designed, boat-inspired marvel (complete with towering masts) leaves most superyachts that line its dock literally and metaphorically in the shade. It’s a special 30 metre sailing boat, then, that can pry admiring stares away from both the club and the massive white motor yachts that sit alongside her. But then Tango, the latest hull in the Wallycento series, is rather unusual. 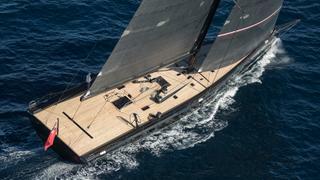 She has a striking black carbon hull and rig, and a flush teak deck that seems to stretch far beyond her true length. She is the second Wally for a repeat client, and the fourth Wallycento, but it’s immediately clear that she differs from her siblings, thanks to her unique design team: Pininfarina for the interior, and Mills Design for the naval architecture and exterior design, which was developed in collaboration with Wally. 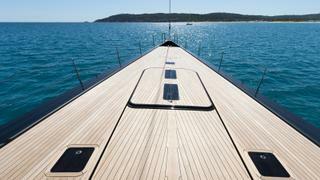 From outside, the flush deck of Tango is both stylish and regatta-friendly. “Tango’s unusual reverse sheerline combines with our ramp deck geometry to allow a smooth unbroken line, running from bow to the stern,” explains naval architect Mark Mills. “Since the first meetings, we shared the same vision of the innovations that can be applied to this type of yacht, like the cutting-edge deck layout that combines our flush deck with bulwarks aft, as introduced in 2006 with Esense, with the ramp deck of Alegre,” says Bassani. This feeling is reinforced by the fact that Tango has no cockpit, in the style of the first classic yachts. But a large removable table can be installed with chairs and a bimini, creating a comfortable area when the yacht is moored up at anchor or in port. Even though Tango follows the same box rule as other Wallycentos, there is no doubt that the latest edits are improvements. Mills Design brought new ideas to the shape of the hull, the rig, the layout of the deck equipment and the all-important weight reduction. “The most obvious development has been rearrangement of the interior layout to produce practical improvements without harming the value of the interior,” says Mills. “By centralising the engine and systems machinery, we were able to co-opt a lot of the keel and mast structure to support these; and place them beside the keel and mast and under the winches to reduce plumbing and wiring.” Centralising machinery also reduced the inertia of the pitching movements, conserving energy and improving performance. They considered hull stiffness too. “We worked with Pure Engineering, whose sophisticated structure used some of the most advanced carbon and core options available,” says Mills. 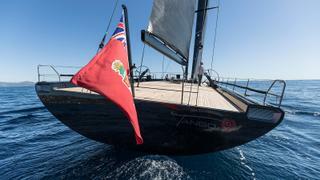 Leaving Port Hercules for a sea trial between Monaco and Cap Ferrat, conditions are light, with only six knots of true wind – but it is enough to get a glimpse of the potential of this cruiser-racer. In a few seconds, the new 3Di sails from North Sails are up, creating a cathedral of carbon. “The deck hardware is powerful and fast: it takes only seven seconds to hoist the jib!” says Wally founder Luca Bassani. This technical wizardry, which the owner describes as “the most advanced technologies in construction, systems, rig and sail handling”, were vital to the brief. After all, he was attracted to the Wallycento in the first place because “I never sailed at 25 knots and always wanted to know what it’d feel like”. 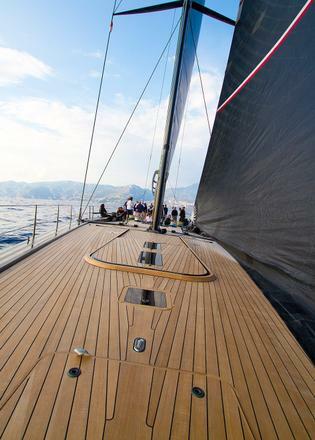 The 45 metre Southern Spars carbon mast offers a total sailplan of 640 square metres upwind, and the boat easily reaches seven knots. “Tango is lively and reactive in light air,” says Bassani. “The feeling at the helm is that of a much smaller boat, balanced and quick.” And a fast turn at the helm proves his point – Tango feels like she’s running on rails and reacts immediately with only one finger on the wheel. Not only was this Wally’s first collaboration with Pininfarina, but the firm was given a free hand, with no details from other Wallycentos carried forward except for the Konstantin Grcic steering wheels. 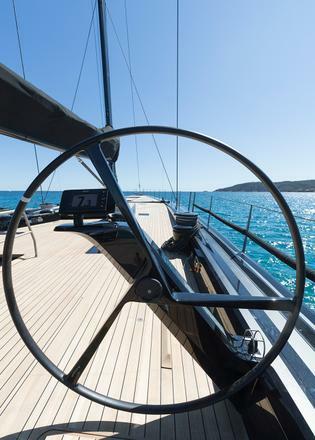 These feature tapering spokes and what industrial designer Grcic describes as “a very rational, even edgy design, which clearly expresses the dynamic forces of steering such a maxi yacht”. The design approach follows the theme of the cockpit-less deck, with staircase-less steps down to the saloon. 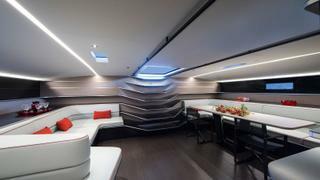 Floating treads, their ends angled not unlike spoilers on a Formula One car or wavelets on an otherwise smooth sea, are suspended from the saloon’s aft bulkhead. The ends of two of the steps stretch out along the saloon walls forming shelves. Bassani enthusiastically describes the steps as well as the entire approach to the interior as “cool”, while Paolo Pininfarina, chairman of the company, notes that “to be innovative in a dream team of innovators” was a challenge. 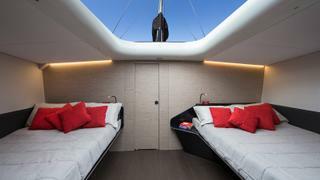 The minimalist interior needed to be super-light and still offer comfortable accommodation for six guests in three cabins. 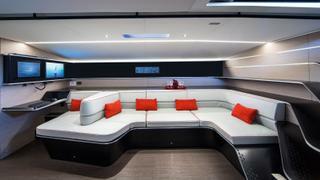 “Thanks to the selection of materials and the innovative solutions of the interior decoration, delivering both function and aesthetics, we generated an ultra-light and super-performing yacht, perfectly suitable for cruising as well as for racing,” says Pininfarina. Key materials used include carbon fibre, wood and leather, creating a sporty atmosphere, reinforced by red accents in the furniture and red automotive-style seams on the upholstery. 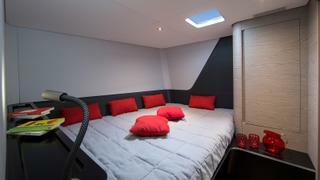 All of the accommodation is situated forward, including the master suite with double beds on either side. 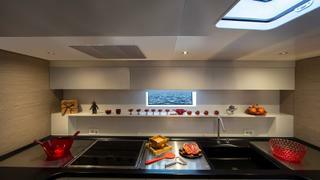 This area can be neatly converted into a sail storage room when the yacht is set up for regatta racing, since a giant skylight hatch gives direct access from the foredeck. The choice of builder was vital to making this design work. Bergamo-based Persico Marine is known mainly for its racing boats and was founded on building lightweight moulded components, beginning with the shells and keels of the 1992 Italian America’s Cup entry Il Moro di Venezia. 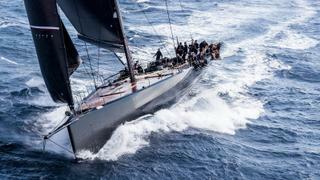 It has worked on some of the most demanding and gruelling yacht classes from TP52s and Mini-maxis to Volvo 65s and other America’s Cup challengers. “A large part of the carbon pieces for Tango were produced in Bergamo and moved to Savona by road,” says CEO Marcello Persico. Eight tonnes of composite were used and Persico reveals that the yard has decided to buy a new facility in Carrara for future Wally projects, such as the Wally 145 – scheduled for launch in 2019. This new shipyard is dedicated to superyachts, while all the racing projects will remain in Bergamo. As for Tango, her owner’s verdict is that she’s “sleek, quick, beautiful looking – and comfortable to cruise”. 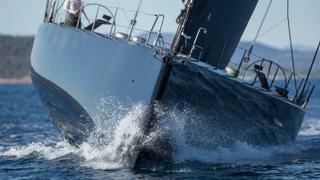 After extensive sea trials, she was ready just a few days before her debut in Monaco. 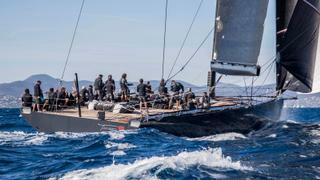 She was in the Principality for only a couple of days, and she left quickly for extra training with the crew in preparation for her first official regatta, Les Voiles de Saint-Tropez, where she joined up with 14 other Wallys, including the three other Wallycentos, Open Season, Magic Carpet3 and Galateia. 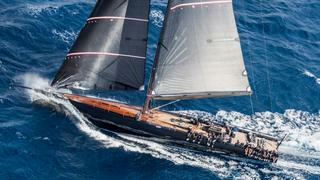 In her regatta configuration, Tango has a crew of 24, and it seems that those extra days spent training and tuning the yacht were well used, since she won her first race in Saint-Tropez. Tango is a thing of beauty – but she’s also fast enough that you’ll be lucky to catch a glimpse. The article was originally published in the June 2018 issue of Boat International.